The United States has failed in Syria and now they have to reconcile themselves with this fact, which is obviously hard for such a global player, Guy Mettan, a Swiss politician, president of the Swiss Press Club and author of the book “Creating Russophobia: From the Great Religious Schism to Anti-Putin Hysteria,” told Radio Sputnik. “In Syria, the liberation came from Russia, and from the government troops with the support of Iran. And now it’s very difficult for such a power as the United States to recognize its failure. That is the reason why, I think, they are trying again and again to give support to jihadists,” Mettan said. 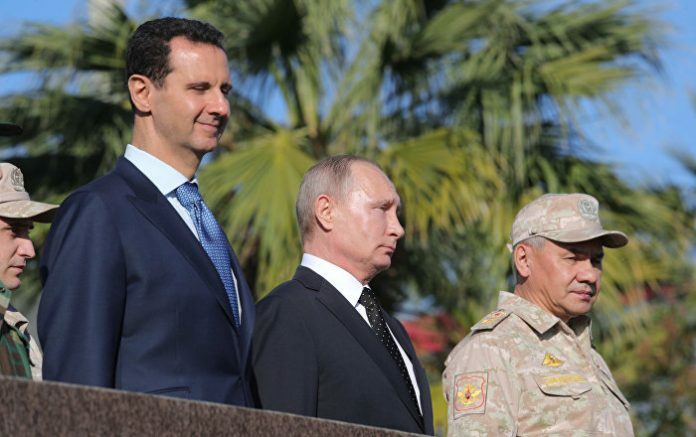 The politician noted that Washington is trying to present the recent state of affairs in Syria as “a success of US diplomacy” and that is why, according to Mettan, the White House is exerting pressure on Russia and the Assad government. On Wednesday, US Secretary of State Rex Tillerson published an op-ed in The New York Times in which he emphasized that Washington “recognize[s] the need to work with Russia” in Syria to provide “a new future” for the country. “We are confident that the fulfillment of these talks will produce a Syria that is free of Bashar al-Assad and his family,” Tillerson wrote. “Would the Syrian people like to see someone like this stay in charge?” Erdogan asked at a joint press conference with Tunisian President Beji Caid Essebsi, in Tunis. According to Mettan, “it is very astonishing to hear” these words about President Assad. He opined that Turkey, Saudi Arabia and the US are discontent with the fact that Bashar al-Assad has won the war against terrorism with the assistance of Russia and Iran and remained in power despite all gloomy forecasts. “I think, if you look at the situation on the ground, they [Turkey, Saudi Arabia, the US] cannot succeed like that,” the Swiss politician noted, suggesting that the rhetoric of Washington and Ankara’s is nothing more than diplomatic pressure ahead of the next phase of Syria talks. He believes that it is a “diplomatic gesture” which will not significantly affect the situation on the ground. The Astana-8 high-level international meeting on Syria took place on December 21-22. It is expected that the Syrian National Dialogue Congress in Sochi will be held on January 29-30, 2018. Commenting on the controversial statement, Mettan noted that the US, the UK and even Germany have repeatedly accused Russia of interfering in their domestic affairs, however, none of them have presented any evidence to confirm the allegations. When asked whether one could expect a thaw in Russo-American relations, Mettan focused attention on the Trump administration’s approval to send lethal weapons to the Ukrainian government to use against the Donbass region. The move has prompted serious concerns in Russia. Citing US officials, Josh Lederman of Associated Press noted that the new arms supplies will include US-made Javelin anti-tank missiles. While Tillerson signaled that the US is ready to negotiate Syrian matters with Russia, it appears that Washington is unwilling to hold talks on Ukraine, the Swiss politician remarked, adding that, apparently, the situation can change in the future. “So such relations [between the US and Russia], will last, I think, for many months,” Mettan opined. The views and opinions expressed by Guy Mettan are those of the speaker and do not necessarily reflect those of Sputnik.